My friend Kitti (www.kittimurray.com) is a sage who says that raising kids is sad sometimes because, while you always record their “firsts,” you never really know when their “lasts” are happening, so you cannot mark them in time or savor them while they happen. True. When was my son’s last sippy cup? His last snooze in a car seat? His last, “sing one more song, mommy!” before bed? I really don’t know, and that makes my heart a bit nostalgic for what “last” I might have overlooked today. Moving is different. Well-defined lasts abound. Tonight was to be our last family dinner in our home, but a track meet ran late, so we ate on the fly rather than around the table. That just-missed-last has me choked up tonight. I just took my second to last shower in my shower upstairs. I’ve carted the last load of groceries into my big-‘ole kitchen. And, this afternoon, I helped a twelve-year-old sort through the last of his scattered and under bed (even in bed!) toys to decide what stays and what goes. Head in hands, half way through, he lamented, “downsizing is HARD, mom.” Yes, son, today it is. Dread is a pretty disgusting emotion. It’s heavy and dark and lumpy and doesn’t really fit. Not that I dread moving, but I dread leaving. I dread my next 48 hours of last. As with this whole move, I think of my refugee friends. I wonder how many lasts were unable to fit into neatly labeled cardboard boxes or carefully sorted piles. I wonder how many good-byes were whispered, lonely into nighttime pillows rather than offered with loving hugs or savored over coffee. I wonder how it feels to be ripped rather than gently pried away from a home. It must hurt deeply, and the dread must linger more fully, when lasts aren’t marked and counted. So today, I am trying to appreciate my cognizance of all of the lasts. We are moving on Friday, and I am feeling a lot like a human Venn Diagram. I know, that’s weird, but I teach English so cut me some slack. Every time I drive out of my neighborhood in Peachtree Corners, I begin to mentally do the compare and contrast in my head. It’s mostly contrast. I love my brick house, but I’ve always wanted to live in a little frame house, too. That silly crack in our garage isn’t going to be there to bug me anymore, but I wonder if living wrapped in asbestos shingles will be any less bothersome to my OCD self. My closet now holds nearly four times the stuff that the new closet will hold. (Doug did the linear square feet…I love my accountant husband.) Can I confidently say that only one in four pairs of my shoes are favorite-enough to make the cut? Our dog will love having a fenced yard. Now she hates going outside in the wide expanse of the front yard, where small dogs feel perpetually unsafe. The QT will be so far away! Ahh, but the Farmers Market will be around the corner! I won’t keep going. That would be painful for you (and for me), but you get the picture. There is much in the way of contrast going on. I could be a photo lab for all of the contrasting images I’m sorting through. 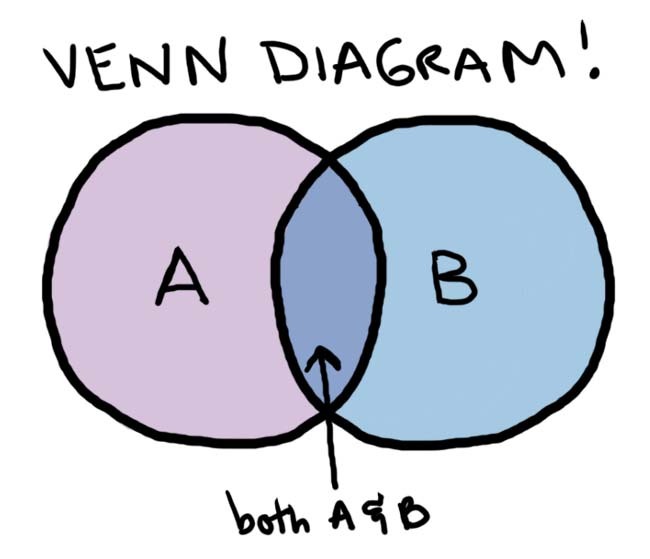 So, my Venn has big, wide outside circles and a pretty skinny overlapping part. Let’s see, what’s inside that little wedge? I get to take my favorite books, my Burt’s Bees chap stick, my pillow, and my coffee pot. Oh, and my desk. I think I’ve figured out where my desk will go. That’s real progress, folks. The accountant husband will be there, and I’m totally fond of him. And, not to spiritualize this silly English teacher exercise, but I am so thankful that Jesus promises that He is Immanuel in all situations. All yards. All closets. All gas stations. All garages or asbestos. Always. So, I think I’ll have to say that the compare part wins. Thank you, Lord, that stuff really isn’t central.